Road Trip Checklist: Never Forget Your Dental Floss Again! When we began creating The Ultimate Road Trip Checklist for our readers here at Road Trip Ready, we initially thought we'd include only obscure items that people would be most likely to forget. But then we realized that people often forget to pack really obvious items, such as underwear, while somehow remembering to bring the spare battery for their camcorder. So, we've tried to strike a balance. The list you're about to download contains about 80 items in 10 categories. And it's yours to download now, FREE, as our way of thanking you for reading Road Trip Ready! Why Do You Need the Ultimate Road Trip Checklist? We've all left on a road trip, driven 50 miles, and then realized we've forgotten something important. Sometimes, it's a small item such as toothpaste. That's easy enough to replace - but when you're on vacation, you don't want extra errands to run. You'll have much more fun if you remember everything the first time. Improvise with your sleeping arrangements tonight, toss and turn amidst all the crying, and wake up tomorrow morning too tired and strung out to drive. Technically, there's a third option: drive off the nearest cliff. But we think the best option of all is to remember to pack all your most important road trip essentials in the first place. Leaving for your trip first thing in the morning? Set your most important items in front of your front door (or door to the garage) the night before you leave. That way, it will be physically impossible for you to leave without them. 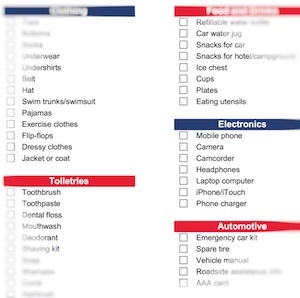 We hope you'll get a lot of use out of The Ultimate Road Trip Checklist. Feel free to customize it by adding your own items on the back of the sheet.